^ A03566 【蕃】異體字. WebMD. [2019-02-01] （中文（台灣）‎）. ^ 西红柿的营养价值，西红柿是水果还是蔬菜？. WebMD. [2018-10-17] （中文（中国大陆）‎）. 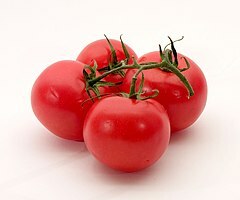 ^ 5.0 5.1 Tomato History. The history of tomatoes as food. Home cooking. [2013-08-07]. ^ Hammerschmidt, D.; Franklin, M. About the cover illustration. Journal of Laboratory and Clinical Medicine. 2005, 146 (4): 251–252. PMID 16194687. doi:10.1016/j.lab.2005.08.010. ^ Andrew F. Smith, op. cit. p. 17. ^ 人造恐慌：擊破謠言和謬誤，告訴你真實的「基改食品」與「有機農業」！. 博客來: 81. [2018-09-10]. ^ 西红柿颜色决定功效（1）. 光明网. 大众养生网. 2016-09-08 [2016-09-12]. （原始内容存档于2016-09-13）.